A late Chinese New Year to all! This is the year of the dragon. 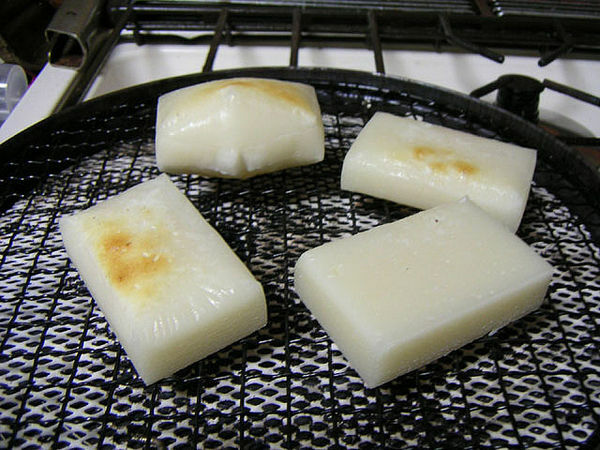 年糕 'nian gao' or rice cake is eaten by many during this festive season. Nian gao is auspicious because it rhymes with the lucky phrase 年高 (also read as 'nian gao') or 年年高升 'nian nian gao sheng', roughly translated to English as 'achieving advancements/promotions year after year'. 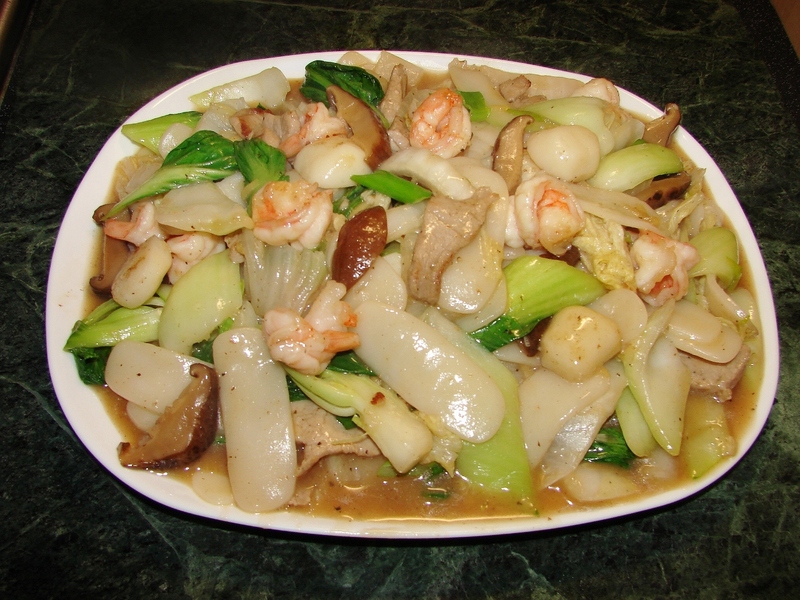 There are mainly two types of Chinese New Year's rice cakes. The sweetened rice cake, in a round or rectangular block, which is usually made with glutinous rice flour is eaten mainly in Southern China like the Cantonese. This sweetened rice cake is very chewy like chewing a piece of rubber but yummy nonetheless IMO, for recipe see this post. 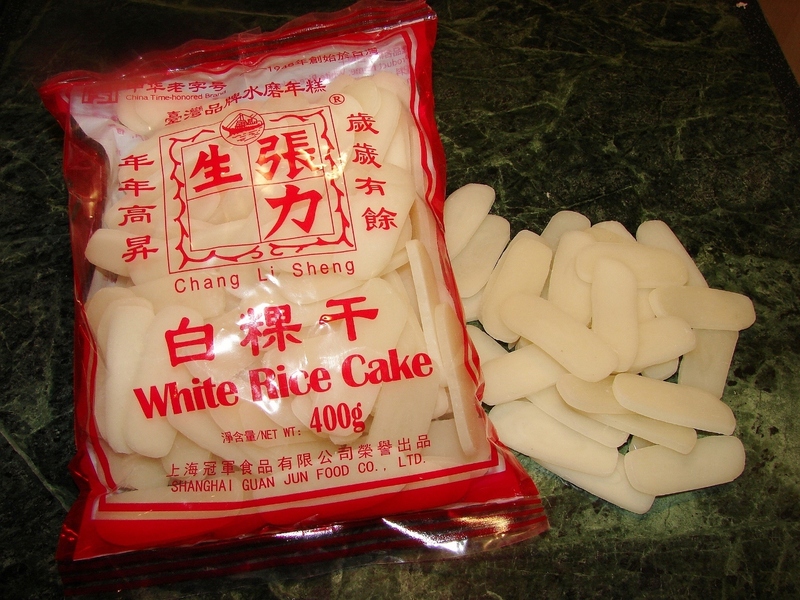 The northerners' rice cake does not look like a cake but slices/sticks of white tasteless stodgy pieces, sold dried or semi dried in vacuum pack, made with normal rice. 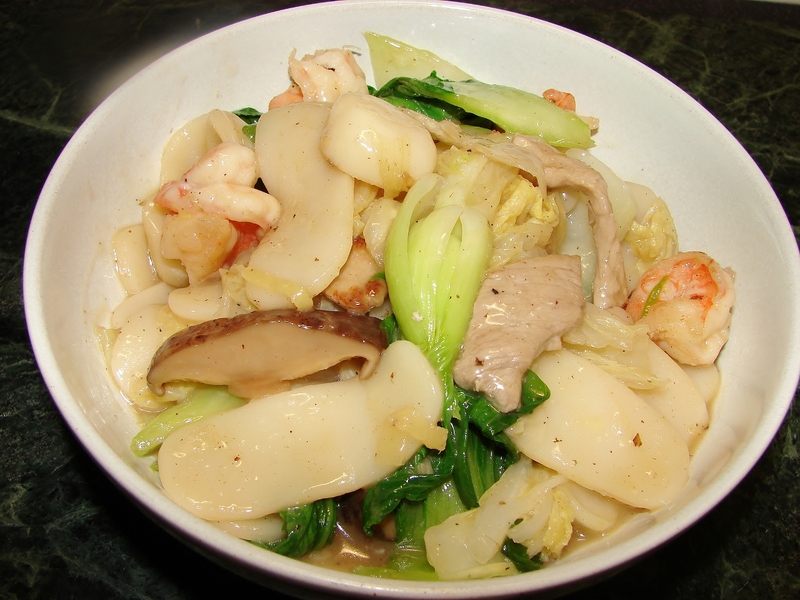 Plain rice cake/sticks are normally stir fried with vegetables and/or meat/seafood like this. In Korea, their rice cakes are very similar to the Chinese plain ones. I think many of you will recognise 'ddukbokki' cooked in a chilli sauce? 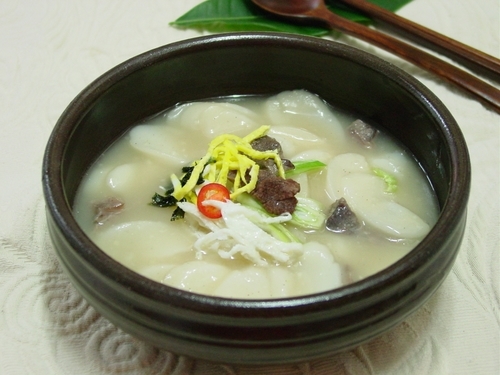 Korean's New Year is the same as Chinese, they also have auspicious rice cake recipe like this rice cake soup. Today's recipe is how to stir fry plain rice cakes. I normally buy the semi dried vacuum pack, see this post, mainly because I didn't have good experience with dried sticks before. When I was in London few weeks ago I bought several packets of the dried sticks determine to have a go again. Cook it couple of times now and I LOVE it. Will keep this as cupboard staple from now. The vacuum pack does not keep for very long in the cupboard it will go mouldy, yuk! Dried sticks are more handy will keep up to a year and I can use as much as I like unlike the vacuum pack which will go bad quickly once opened. I now know how I got it wrong before with the dried stuff, i.e. they must be soaked for a very long time like overnight to 24 hours before cooking. If not they will not cook through easily and by the time they are stewed and softened on the inside the outside surface will be too gloppy and slimy. The next step is to boil them for few minutes before adding to the stir fry mixture. 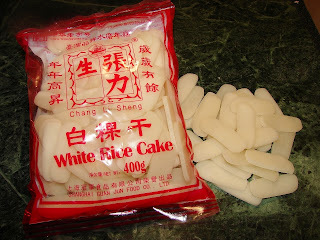 If you never have this plain rice cake before, it does not have any taste it will absorb any flavour you add to it. The texture is similar to wide rice noodles or hor fun, soft and slippery on the outside surface but when you bite into it, it is much much more chewier than wide rice noodles. **Dried rice cake will expand to about 1.5 its original size when soaked and 2x it's original size when cooked. Here is the tried and tested recipe my way. Recipe will feed two. Soak the dried rice sticks overnight for at least 10 hours or up to 24 hours with cold tap water. Prepare the meat, seafood and vegetables. You don't have to follow my list of ingredients, you can use anything you like, like fried tofu pieces, brocolli, bean sprouts, fresh button mushrooms, sugar snap peas, sweet pepper, beef, belly pork etc....You can use black bean sauce if you like instead of oyster sauce. Marinate the pork with a little soy sauce, pinch of pepper, few drops of sesame oil and a little cornflour. Mixed and leave aside for a little while. For the King prawns and fish balls if using frozen and you forgot to defrost in advance, soak in water till defrosted. Give it a squeeze to remove excess water. You can score the back of the prawn so it will roll up like a ball when cooked. For the mushrooms if you don't have time to soak, put them in a cup with water and microwave for few minutes, stirring few times in between. When totally softened, rinse and cut. Heat a pot of water till boiling. Add the soaked rice sticks and few drops of oil. Gently stir to prevent the rice sticks sticking together. When the water come to a boil again check if the rice sticks are softened and pliable, it is time to remove them. Rinse under cold water then soak in some cold water while stir frying the other ingredients. Soaking in water in the last step is to prevent them from sticking together. Heat the wok with a little cooking oil. When almost smoking, add pork and give it a few stir, then add in the prawns and fish balls. 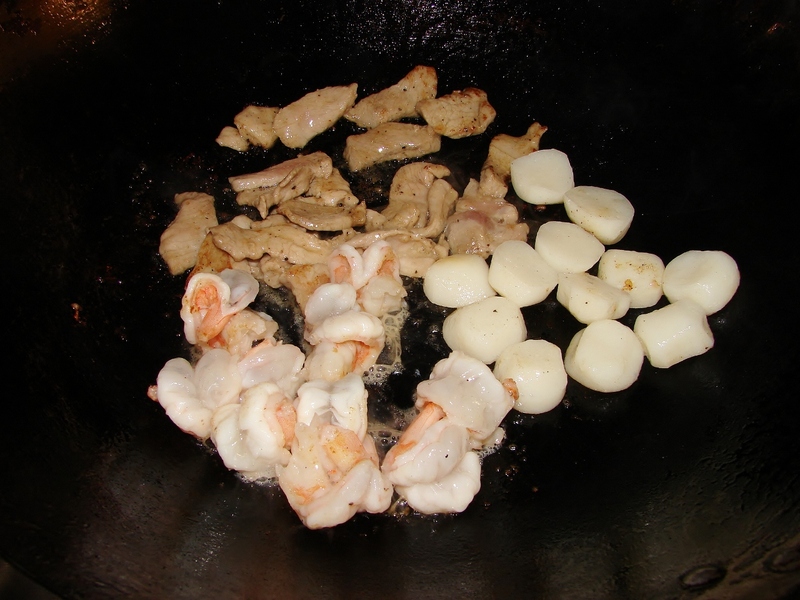 Stir/fry till meat and prawns are cooked and slightly caramelised. Stir in a little cooking wine. Remove and set aside. Using the same wok without rinsing add a touch more oil, add in half the spring onion, ginger and garlic, stir fry till fragrant. Add in the mushroom, stir then add in the Chinese leaf. Stir till heated through. Add in 1 cup of water (you can use the mushroom soaking water). Let the liquid come to a boil. Add the white part of pak choi, stir and when heated through add the rice cake. Stir gently and cook till everything is softened and heated through. Season with 2 - 3 tbsp oyster sauce, dash of light soy, few drops of sesame oil and pinch of pepper. The sauce will be reduced and thickened by the rice cake as it cooks. Finally add in the green part of pak choi, the precooked meat and seafood and the remaining spring onion. Stir till just heated through. This recipe is so simple easy and tasty. Only takes 5 - 10 minutes! Great with rice, noodles or pile high on fresh bread. If using frozen prawn, defrost before use. If you forget and wanted to use it quickly just soak in cold water till defrosted. Drain and lightly squeeze to remove excess water. If you like the prawns to curl up like a ball, make a slit on the back of the prawn without cutting all the way. If you are lazy just leave them as they are. Marinate the prawn with a dash of light soy, a little cornflour, few drops of sesame oil and pinch of pepper for few minutes. Cut the Chinese chive into 2 - 3 cm long. Beat the eggs with pinch of salt and a little cooking wine. Add in the Chinese chives, give it a quick stir with the prawns. Push the chive and prawns to one side. Add a touch more oil to the empty side of the wok. Pour in the beaten egg. Stir the egg gently to scrmble it till almost set. 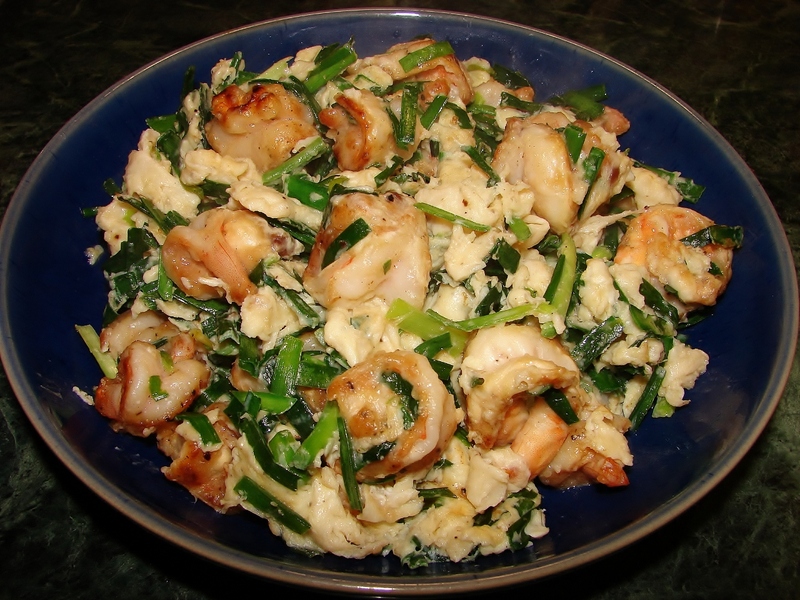 Stir in the chive and prawns. That is it. Ready to eat. Easy peasy! 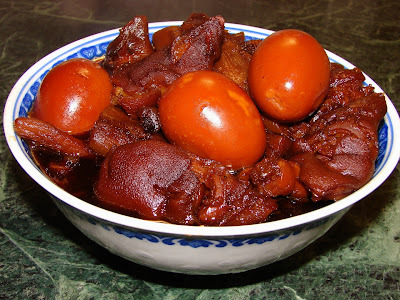 Pig trotter and ginger stewed in sweet black vinegar is an old traditional Cantonese recipe originally formulated for mothers after birth, to keep new mums warm during the first month after birth. 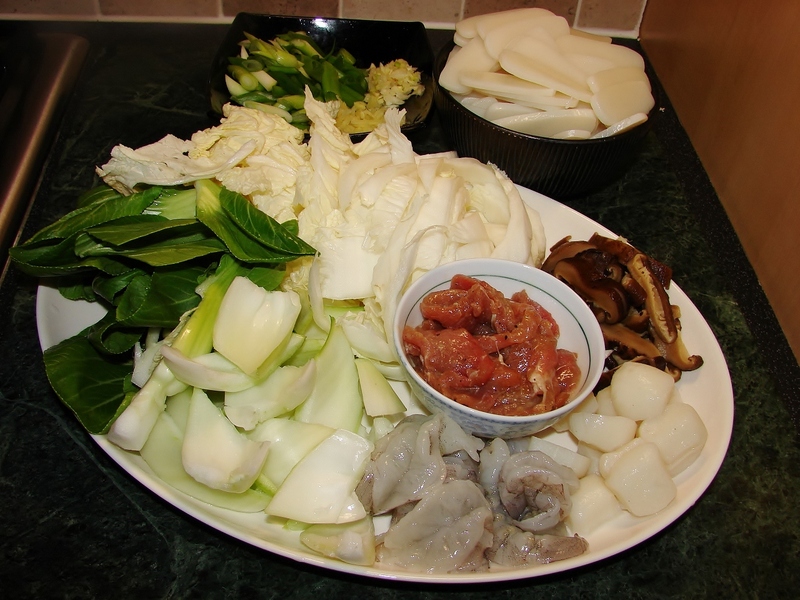 Also many Cantonese families who has new baby will cook a shed load of this, together with some red coloured hard boiled eggs in their shells and some some chicken cooked in homemade rice wine, all these packed and given to friends and relatives proudly announcing the arrival of a new baby. So can everyone eat this gingery vinegary pork? Yes to most people only people with high blood pressure and high cholesterol is to avoid this or eat less because ginger will raise blood temperature and trotter is high in cholesterol. I adore this sweet, sour and tasty pork and ginger since I was a kid. I love it during winter over here when the weather is very cold out there. Eating a bowl of this vinegary pork trotter will keep me warm and cosy. I was told anyone with cold feet and insomnia will benefit from eating this. This stew is a labour of love and will take a long time to prepare so it's not for you if you just want to rush it and eat within an hour or two. This will take about 2 days to prepare and cook and another day or night refraining from eating so the flavour can get better. If you never have this before I would describe it as a bowl of deep brown looking soft and succulent pork trotter/pork hock flavoured with a gingery sweet vinegar. The ingredients are very simple vinegar, ginger, trotter and/or pork hock, hard boiled eggs and salt. Massive amount of ginger is used to prepare one pot of this. This is stewed and pickled in the sweet vinegar, most people including myself love to eat the chunks of ginger but don't like them too spicy hot, that is why the ginger is stewed for a very long time. 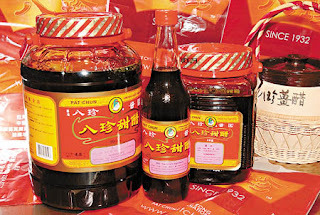 Not any kind of vinegar can be used, anyone who has learnt how to cook this from their mum or granmother will probably only recognise one brand of vinegar which is Pat Chun's sweetened vinegar from Hong Kong. It is not cheap in UK around £5 a bottle of 600ml. This vinegar is quite sweet and syrupy. I normally also add some unsweetened black rice vinegar so the stew is not so sweet. Vinegar is the only liquid used to make this stew, no water is necessary. The only seasoning needed is salt, do not add any soy sauce. Hard boiled eggs are also indispensable, after soaking in the sweet gingery vinegar they will become firm and very tasty. So if you like this and looking for a recipe here is how to prepare this. Get ready a wok or large frying pan, heat it without any oil. Then add in the ginger pieces, dry fry at medium heat for few minutes till hot and slightly brown on the edges. 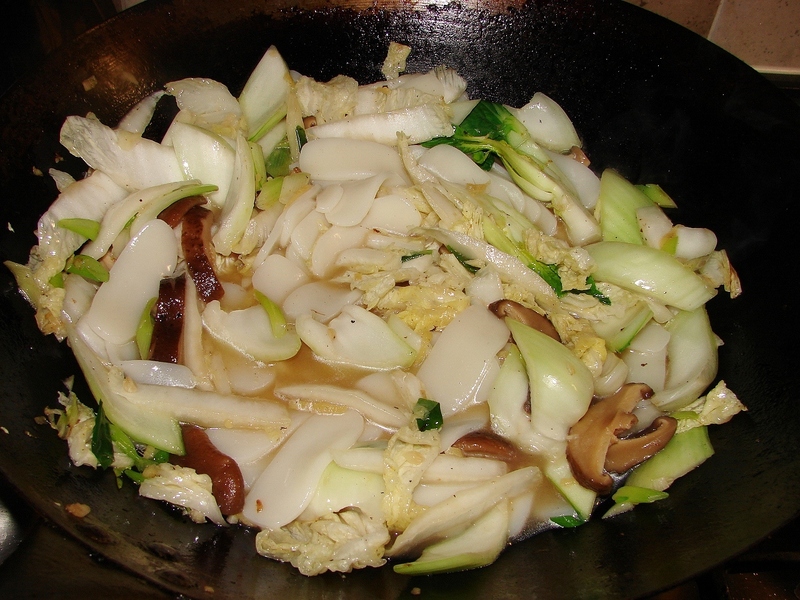 There is no need to stir continuously just fry till pieces are slightly brown all over. Then add a little good quality 100% sesame, stir fry the ginger for a little while longer till fragrant. Leave aside. You can fry the ginger in batches. Get ready a medium large cooking pot to cook this stew. Do not use aluminium, cast iron or pot with a non stick coating because they will react with vinegar. Best use claypot, glass casserole pot, stainless steel pot. Slow cooker with a crock pot is suitable for this. Put fried ginger into the pot, add about 1.5 bottle of vinegar. Vinegar must cover the ginger. Simmer this at medium low heat till boiling. If you are using a slow cooker. Pour this into the crock pot and stew for 8 - 10 hours. 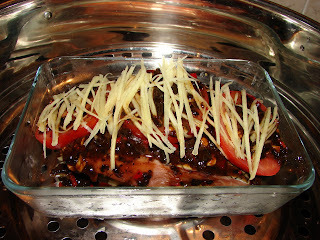 If you are cooking on the stove only, continue simmering at low heat using the same pot for 1.5 - 2 hour, with the lid on. Do not let the liquid dry up, if it does dry up a lot, add some water or more sweet vinegar. After cooking do not open the lid and leave it to cool slowly and leave the ginger to soak in ginger overnight or up to 24 hours. Then have a taste if the ginger is tender and not too spicy for your taste, continue to next step. If ginger is still very spicy, reheat till boiling and simmer for a while then turn off heat and leave it too cool slowly. Leave if for few hours or overnight again. By this time the ginger should be tender and completely pickled and sweet. The next step is to prepare the trotters and/or hock. Get ready a kettle of boiling water. Put the pork in a large bowl, pour in the boiling water leave it to soak for a while. If there are stubbles or hair you will see them clearly after soaking in boiling water. You can either pluck them off using a tweezers or pat dry the skin and burn the hairs off on naked flame on the stove. Then using a blunt small knife and scrape the skin repeatedly under slow running water. You will see scrum, dirt and deadskins being scrape off. For the trotter watch out for an outer skin, between the toes and also the end part of the toes, which can be scraped off or peeled off. If you get trotters from English butcher or supermarket it is usually in one whole chunk, but if you get it from Chinese butcher you can ask the butcher to chop it or sold in packet already chopped. For the hock I just trimmed off the bone and cut the meat with skin into large chunks after cleaning. The next step is to blanch the meat. Get ready a pot of boiling water. Add the meat and bones pieces. Boil for 5 - 10 minutes till a thick scum floating on top of the water. Remove the scum with a skimmer. Discard the blanching water. While you are blanching the meat, heat the vinegary ginger to boiling. Add in the meat and bone pieces. The vinegar should cover meat if not add in some or all the remaining vinegar still in the bottle. Add in 1 cup of unsweetened black rice vinegar. Continue heating till the liquid is boiling. Cover and simmer gently for about 30 minutes. Check the meat to see if tender, if not continue boiling for another another 10 -15 minutes. The meat will tenderise much quicker in vinegar so watch it carefully. Do not let the meat softened too much or the vinegar sauce can become sticky due to the pig skin (gelatine) melting into the sauce. Season with some salt and nothing else. Skim off the fat floating on the surface. While the meat is boiling, boil the eggs and peel the shell. When the meat is tender, add eggs into the stew, buried them as much as you can so they are totally covered in vinegar. Heat off and let it cool slowly. This stew is ready to eat now if you can't wait, but if you leave it aside it will become much better flavoured after few hours or overnight. Once cooled, reheat and serve. If there is any more fat on the liquid surface skim it off. Eat on its own as a snack or eaten with rice. Chinese New Year is just a week away. In Chinese tradition, fish is always a must have for the festive meal. Fish is auspicious to symbolise there will always be plenty year after year. In Chinese phrase it is called 'nian nian you yu' 年年有餘 or 年年有魚. Here the word fish 魚 sounds the same as 餘 which means plenty left. Steamed fish is very popular for any Chinese festive meals. Fish for steaming should always be fresh not frozen because frozen fish tends to be tougher, less juicy and can smell quite fishy. 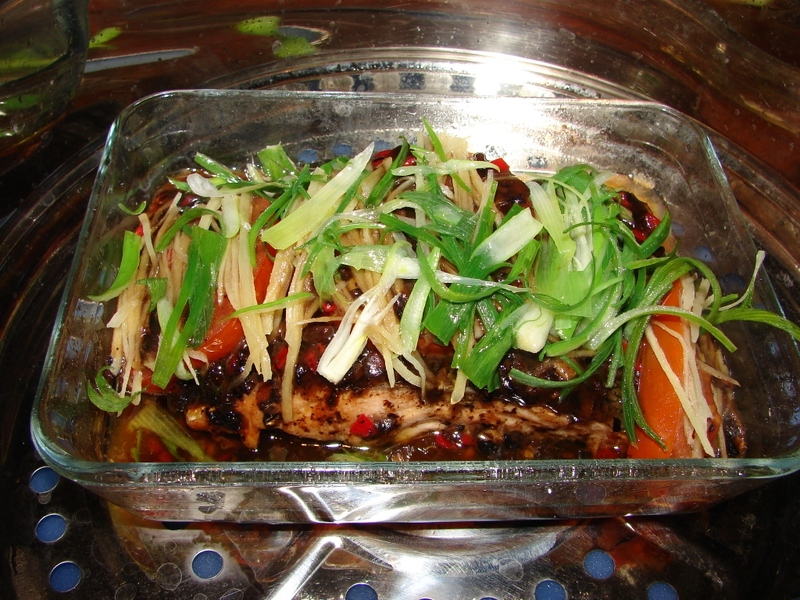 Steamed fish with black beans is a common Chinese recipe. I have modified this to suit my taste. This is probably one the most repeated recipes I have done. It's quick, easy and irresistibly scrummy. 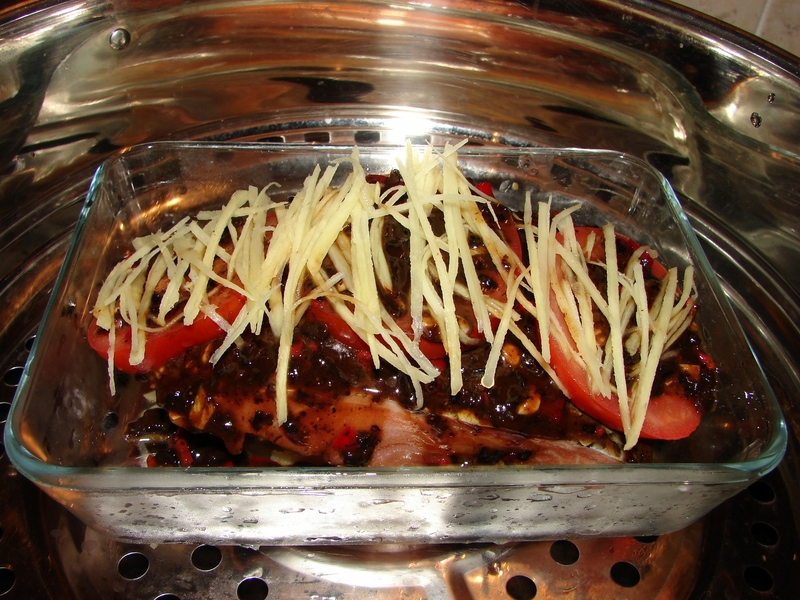 The recipe is steamed fish with a black bean sauce topped with tomato slices. The final touch or step of this recipe I find very important is to pour sizzling hot oil over the spring onion and sauce which really brings out the flavour. Adding tomato is something I learnt from mum which adds a sweet and sour taste and mellow down the strong flavour of black beans. For the fish any fresh juicy fish is fine with or without bones/skin. I have done the same recipe with salmon, trout, whole lemonsole, skate wings and super fresh cod. If you want to do this for special occasion you can use monk fish or turbot. Mackerel is too fishy smelling for this recipe unless is it super fresh straight from the sea. If you use fresh tuna cooked it medium rare or it will be too tough cooked through. Sword fish or similar large fish is far too meaty and tough for steaming. If you are outside UK, you can use any other fresh local fish. Fish fillet, fish steak with bone or whole fish are all suitable. Fish with skin make sure you remove the scales. Clean and put the fish onto a deep dish. Cut the tomato into thick slices. Spread them on the sauce. Spread the shredded ginger on top. Get the steamer ready. When water is boiling heat high and steam for 8 - 10 minutes. To check if the fish is cooked pierce the thickest part with one chopstick if goes in easily it's cooked through. If you use a electric steamer this may take a bit longer to cook. If you don't have a steamer, you can cook this in the oven. To cook in oven make a few adjustments; i.e. add 2 - 3 tbsp of boiling water onto the bottom of the dish to create steam and keep the fish moist, cover the dish with foil and cook/roast at 200 deg for about 20 - 30 minutes. Or alternately, this can also be cooked in the microwave. You will need some extra water like oven method, cover the dish with a lid or cling (piece with a hole or two) then microwave at medium high heat for about 6 - 8 minutes. When the fish is cooked. Turn the heat off. Heat couple of tbsp of cooking oil in a small pan, add ginger slice and sichuan peppercorns heat till the oil is fragrant. Remove ginger and Sichuan peppercorns with a slotted spoon. Quickly spread the spring onion onto the fish, do not cover with lid. 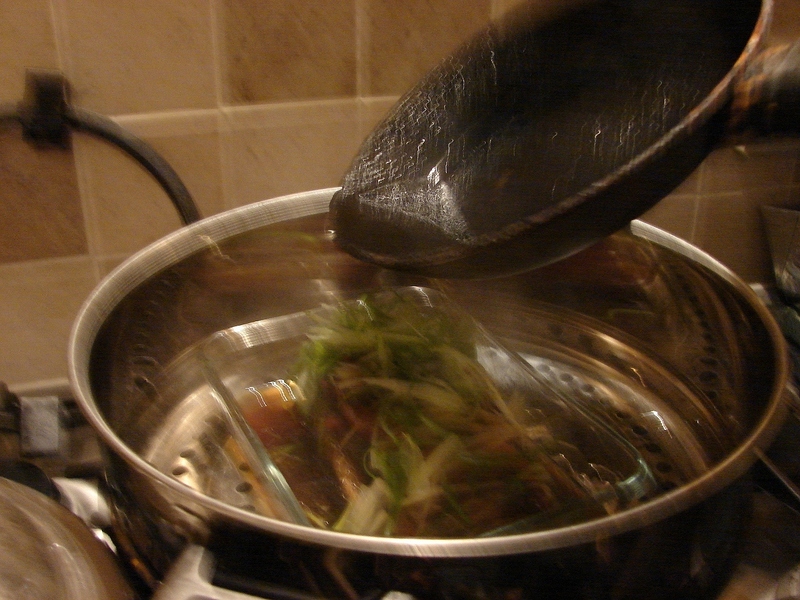 While you spread the spring onion, continue heating the oil at medium low heat till slightly smoky. Stand back and pour the hot oil over the spring onion and sauce. This will sizzle rapidly and wilted the spring onion. Pour the hot oil onto the dish. Sorry for a very fussy picture I was too busy pouring the oil than focusing the camera. No second chance! This recipe is enough for up to 2 persons. If you cook for more people increase the quantity and cooking time. Steaming time for double the quantity will probably take another 3 - 5 minutes more. Today's I will introduce to you a Taiwanese speciality with an unusual name called "chang ying tou" 蒼蠅頭 or in English "flies' heads". 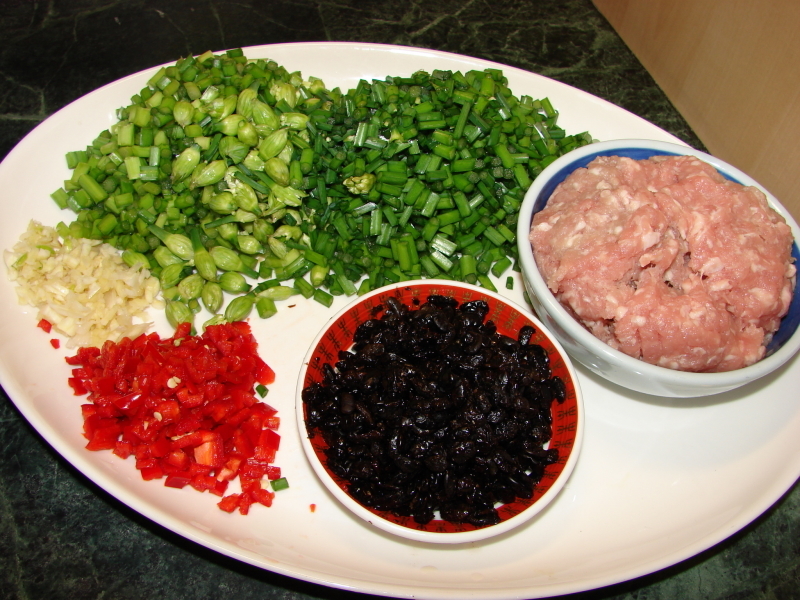 The flies' heads relate to bits of fermented black beans or dousi. 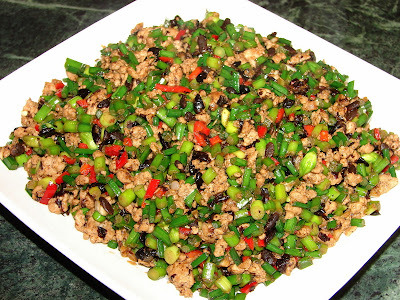 This is a pungent, salty and spicy stirfry with chive flowers, pork and fermented black beans flavoured with some garlic and chillies. It's tasty with plain rice or eaten as part of a Chinese meal. Can you visualise this with the dousi? If you have never come across chive flowers here is a picture below. When selecting chive flowers find those with thicker stems where possible, the very fine thin ones usually quite stringy, the thicker ones are more tender and sweeter. 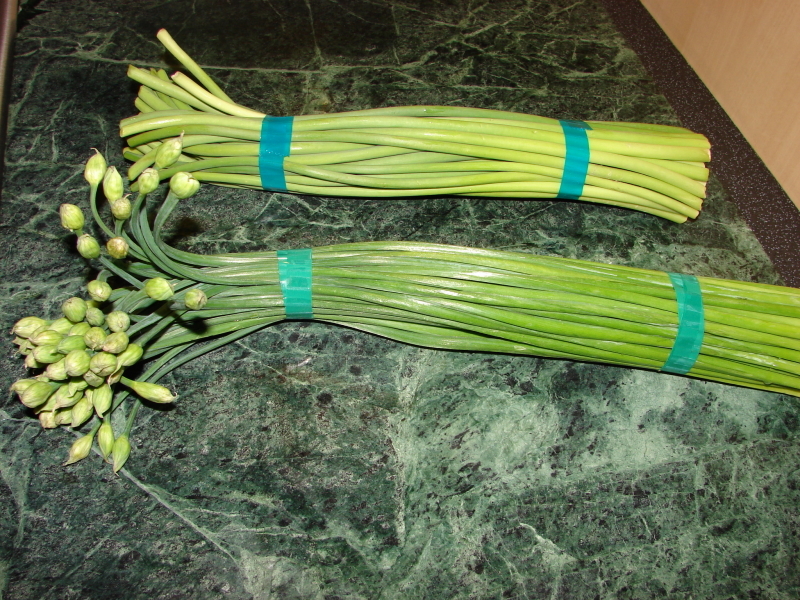 If you cannot find chive flowers, garlic sprouts are equally good with this dish, as shown in the picture below. These vegetables are only available from Chinese or oriental supermarkets. If you don't like the pungent, oniony/garlicy taste of chive flowers/ garlic shoots, tender asparagus is a good mild substitute or green beans are good too. 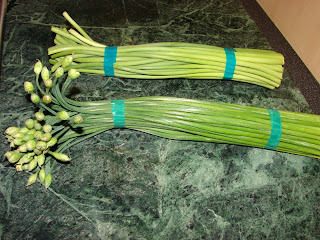 The top bundle is garlic sprouts the bottom one is chive flowers. This recipe is quick and easy to prepare. Just chop and stir fry, ready to eat within 10 - 15 minutes. This is the kind of cooking I like after work when I just want something quick. Trim off a bit of the end of the chive flowers. Cut the vegetable into tiny pieces. The flower part is edible too do not throw away. Rinse black beans with a sieve, shake off excess water. Heat the wok till hot then add a little cooking oil. Heat high and add pork. Keep stirring and breaking up the pork into tiny pieces with a cooking spatula. Keep stirring till the meat turned white and no more moisture coming out of the pork. When the pork started to caramelise, add garlic and dousi. Keep stirring (if you see the work getting a bit sticky, turn the heat down), till garlic and dousi giving out a pungent smell. Add the chopped chive flowers and chilli. Stir fry for a little while, add dash of cooking wine. Continue stir frying till vegetable is cooked. These chive flowers do not take long to cook, it can be eaten semi raw with a more peppery taste and crunch. If you cook it a bit longer the vegetable will get sweeter, less pungent or peppery and less crunchy. It's up to you how you like it cooked. Finally when done add dash of soy sauce, oyster sauce and sesame oil to taste, do not add to much soy sauce and/or oyster sauce the fermented black beans are salty.